Most commercial refrigeration compressors are being overworked and operating very inefficiently as they struggle to maintain the correct internal setting of the display cases. 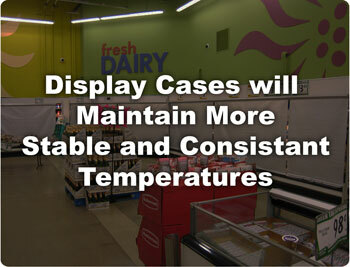 For most commercial refrigeration displays, their open design leaves them susceptible to the punishing effects of warm ambient air spilling into the case. When the warm air is drawn into the case, the internal temperatures rise as does the holding temperature of perishable food products. The refrigeration system is then forced to draw in the warm air and cool it before it can circulate it back out. It is a vicious loop that consumes a lot of energy, creates a lot of waste and contributes to higher electricity bills. ECONOFROST thermal refrigeration night covers reflect 70% of the heat that would normally enter open refrigerated display cases. Constructed with woven aluminum fabric, a night cover device disperses store heat in multiple directions, effectively maintaining colder, more stable temperatures throughout the refrigerated display case. ECONOFROST retrofit refrigeration blinds were engineered specifically to create a thermal barrier and insulate commercial refrigeration cases; to reduce inefficient energy consumption, reduce unneccessary product spoilage and restrict sky-rocketing operational costs. Night covers are designed to be used at night so they don’t interfere with the shopping process. In fact, by keeping hot air out of the refrigeration case, grocery store aisles are warmer and more inviting for shoppers. The best thing about using night blinds on a stores’ open refrigeration cases is the continued freshness and extended shelf life and appearance for fresh foods. 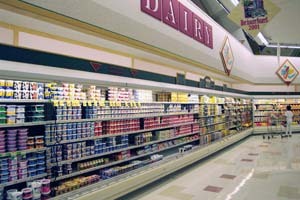 Stores that use night curtains not only save on energy expenses but they save significant volume of fresh foods. Ensure your perishable fresh food items are protected. Maintain colder temperatures (up to 15 hours after the night blinds were used) just by installing ECONOFROST night covers on your cases.Don’t wait to be regulated for stricter energy consumption, proactively enjoy the many benefits and savings night covers have to offer. To learn how much ECONOFROST night covers can save your store Contact us today.